“Well, first of all I have to tell you when he hit me over the head with that coconut we hadn’t planned it. He just did it out of the blue..."
"I improvised almost everything I did. There was no rehearsal. I had no script to work with like they do today. I could do thirty minutes on a Puerto Rican with freckles. After a while, because the Pit was improvised, no one wanted to do it. After a while the best talkers in WWF were coming on and it became a battle of wits. It never mattered if I lost or won, because you were watching..."
"Roddy was a real character, and with me coming from the Fiji Islands, he was teasing me about eating bananas, pineapples...then from nowhere he picks up the coconut..."
"Oh man, I hit him hard...so hard it would have killed a mule..."
"I was just staring him down because I ain't going to look away, you know, I've got to see everything happening, you know? When it happened, brudda, when it happened and he hit me over the head with that coconut; thank God I had my bandana on, you know? But still it cut me open and I got so dizzy. I just kept going one way and I remember going into a wall and went down..."
"[Do I regret hitting him so hard?] Yeah. A little bit. Jimmy Snuka...he's one of the greatest. He outranks me, man. They told me that when he got back to his dressing room he just sat there for like ten, fifteen minutes. Nobody could talk to him. He just stared down. He's never quite been the same..."
"That whole thing, brudda, is where it started. 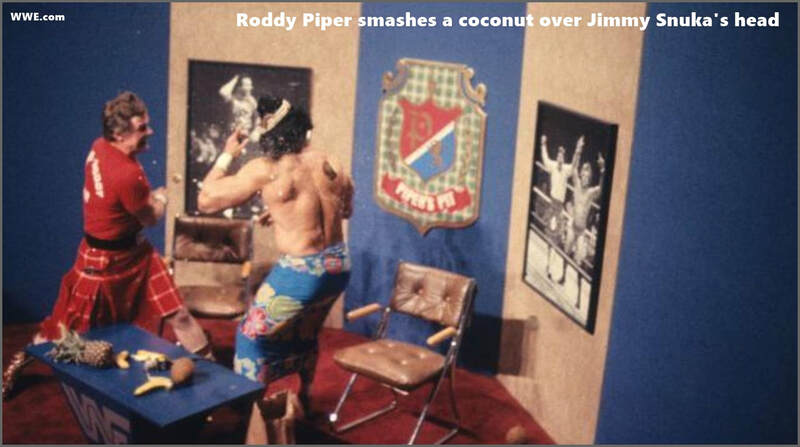 We both knew, when it was all said and done, I told him 'I think we got them...'"
"Jimmy Snuka is the one responsible for the popularity of Piper's Pit - not Roddy Piper..."
"Bra, you know I still have a headache..."
#StorytimeOnSunday - "Have A Banana!"